Braces vs Invisalign, costs, and pros & cons of each are common questions that people have. We’ve put together this handy resource to help you better understand your options so you can make the best decision. Are you interested in getting a straighter, better-looking smile? Orthodontic treatment is a great way to boost your oral health, self-esteem, and social life! Deciding between Invisalign or Braces can be a tough decision, though. Knowing some specific facts about each treatment can help you make an educated choice about what’s right for your smile. Both Braces and Invisalign are used to straighten teeth using the same method: applied pressure. But how are they different from each other? 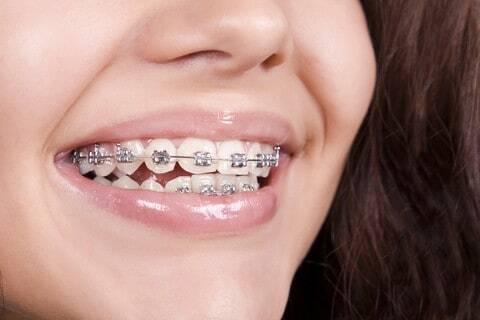 Traditional braces have been used for centuries to correct crooked smiles. This technique consists of aligning your bite with wires and brackets that are bonded to the front of your teeth. During your time in braces, you’ll need to come in for regular adjustments. Our Barrhaven Orthodontist, Dr. Cohen will tweak the specific components – placing pressure in certain areas, which is what helps to coax the teeth into their desired positions. Invisalign clear braces have been around for over 20 years. It’s quickly grown to be an equally popular method for straightening smiles. This process consists of wearing a series of clear, semi-rigid, plastic aligners over your teeth. Each set of trays vary slightly from each other, showing the progression of movement your teeth will make throughout the overall course of treatment. Every pair of trays are worn for one week before moving on to the next ones. Most people find Invisalign an appealing orthodontic option for several reasons. First, the aligners are clear, so most people won’t notice that you’re wearing them. You don’t have to feel self-conscious about smiling, talking in front of people, taking a picture, or seeing friends, family, and co-workers. The second big advantage of Invisalign is that the trays can be removed to eat and brush your teeth. This results in a healthier oral environment when compared to traditional braces. Food particles and plaque can be brushed away as easily as they always have been before. Finally, there are few dietary restrictions when it comes to Invisalign. You’re free to eat what you’d like since you get to take the aligners out at mealtime. Though Invisalign therapy has its pros, there are some cons as well. Having to keep up with aligners can be a hassle at times. Since you have to take them out to eat, it’s possible to forget them in a restaurant – sitting on the table or wrapped in a napkin. To prevent yourself from misplacing your trays you should always have (and use) a retainer box with you wherever you go. Also, the fact that you must brush your teeth after eating – before re-inserting the aligners – can be inconvenient, especially if you don’t have a bathroom around. In order to get the full benefit of this treatment, the aligners need to be worn at least 20 – 22 hours a day. If you don’t wear the trays, then your teeth won’t move – it’s as simple as that. While this sounds really easy, some people will forget to wear their aligners and not be fully committed to the process – delaying the results. On a side note, our orthodontic office can offer a series of aligners specifically for teenagers. The trays have a blue compliance indicator built into then. This tracking method is used to ensure that teens wear their aligners enough. As you wear the trays, the color fades. This helps both the patient, parents, and our orthodontist know that the teen is being compliant. The main advantage of traditional braces is that this method can treat some conditions that Invisalign may not be able to. For example, if you have large spaces between your teeth, a tooth that is set high in the gum and needs to be moved vertically, or a severe underbite, you may only be a candidate for traditional braces. Another pro to braces is that you don’t have to keep up with them. Since they’re glued to your teeth there’s no need to remember to put them in and take them out, or have any chance of misplacing them. As with all great things, traditional braces come with its disadvantages. First, for some people, showing any amount of metal when exposing their teeth is a deal breaker. Second, cleaning around braces requires extra attention and time. Lastly, braces tend to be a bit more bothersome than Invisalign. While both these methods can cause some soreness from the pressure that’s put on your teeth, braces have the added factor of wires and brackets that can cause sores in your mouth. Click the link that follows to find out the answer to: do braces hurt? Depending on the type of movements your teeth need, your treatment time could be anywhere from 12 months to 3 years. While some patients will see their smile transform in as little as 6 months. In most cases, Braces and Invisalign will take about the same amount of time. In some instances braces are faster, in other Invisalign is faster. At your consultation, Dr. Cohen will be able to let you know which one is fastest when it comes to Invisalign vs Braces. When it comes to the same patient and the same treatment, both Invisalign and Braces will usually cost about the same. The length of your treatment may determine the price. When you come for your orthodontic consultation and we evaluate your teeth we’ll be able to give you a more accurate cost. If you have dental insurance, your policy may pay for a portion of either one of these treatments. When it comes to the outcome of your new smile you want to make sure that you don’t leave the results in the hands of just anyone. Dr. Charles Cohen and the expert team at Braces Haven have the knowledge and compassion needed to ensure that the outcome of your treatment is as great as possible. If you’ve been considering Invisalign vs Braces, then give our Ottawa Orthodontist a call today. We look forward to meeting you and your family.